On 21 October 2016, UN Member States agreed upon the New Urban Agenda at the Habitat III Conference in Quito, Ecuador. This Agenda sets a new global standard for sustainable urban development and will help us rethink how we plan, manage and live in cities. 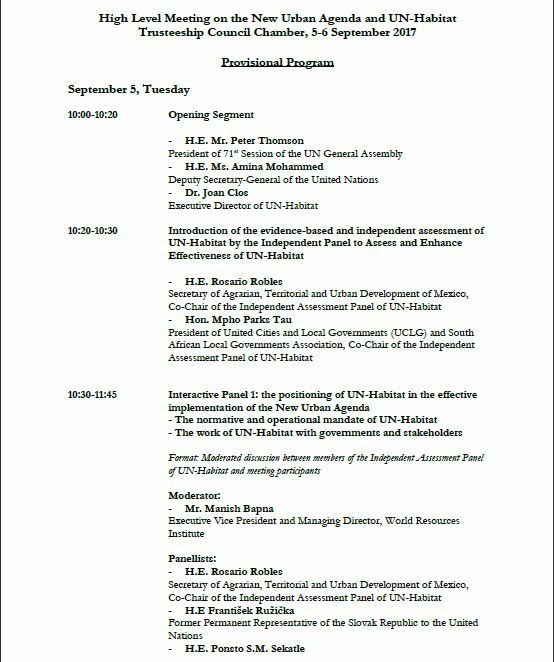 To maintain momentum around the implementation of the New Urban Agenda and to reflect on the positioning of UN-Habitat in that regard, the President of the UN General Assembly convenes a two-day high-level meeting of the General Assembly on 5 and 6 September 2017. 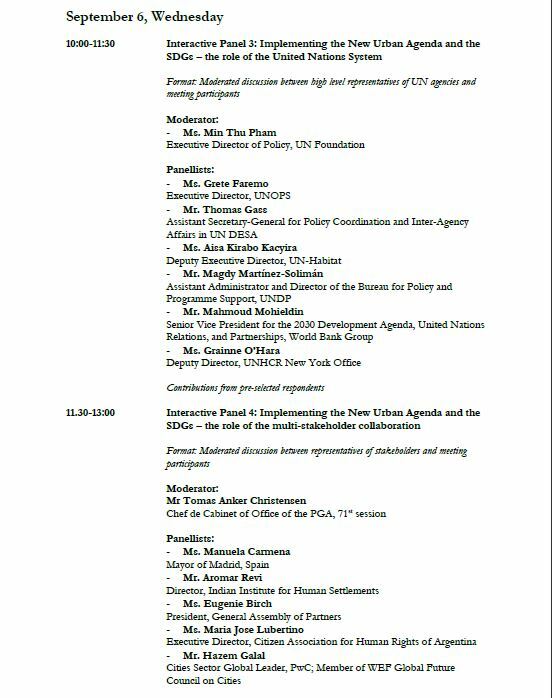 The meeting will discuss best practices and success stories in relation to the implementation of the New Urban Agenda. 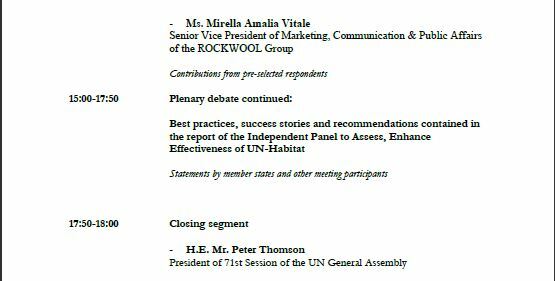 It will also address the measures contained in the Report from the Secretary General’s Independent Panel to Assess, Enhance Effectiveness of UN-Habitat after Adoption of New Urban Agenda, which was published at the beginning of August 2017. 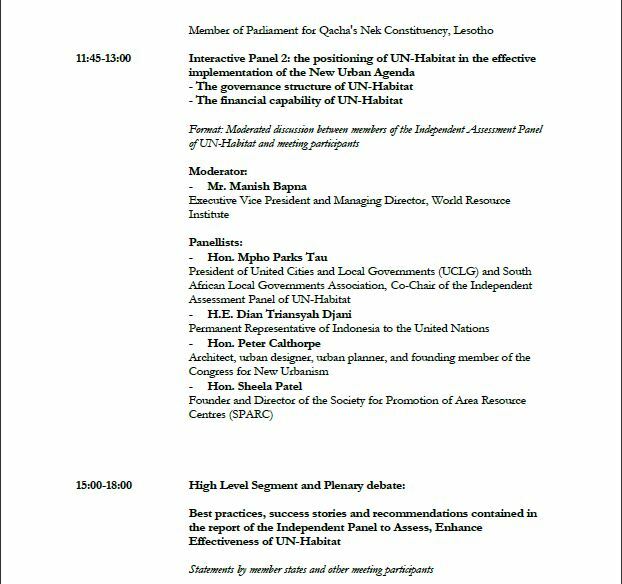 The meeting will consist of an opening segment, panel discussions and a plenary debate. Member states will have an opportunity to engage with members of the Secretary General’s Independent Assessment Panel as well as representatives of local and municipal authorities, mayors, civil society, academia, members of the UN system. Build a greater understanding of the recommendations contained in the Report from the Secretary General’s Independent Panel to Assess, Enhance Effectiveness of UN-Habitat.